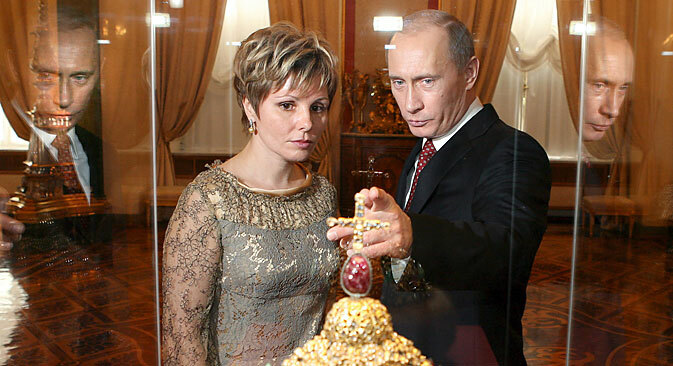 General Director of the Moscow Kremlin Museums Yelena Gagarina, daughter of Yuri Gagarin, has been director of the country's principal museum for 14 years. In this interview she speaks about the acquisition of a new building on Red Square, about how a set of Kalashnikov automatic rifles got into the collection, and about the museum's plans for future exhibitions. Nezavisimaya Gazeta: Which exhibitions are you now preparing? Yelena Gagarina: The "Knight Orders of Europe" exhibition will last until the end of summer, and then we will start preparing the halls for the exhibition on Russian Tsar Boris Godunov (1552-1605). The theme of Godunov seems to lie on the surface, but in reality not that much is known about that period [Boris Godunov was tsar during the Time of Troubles – the government crisis in Russia, which ended in 1613 with the coronation of Mikhail Fyodorovich Romanov – RBTH]. Next summer we will organize an exhibition of one of our leading jewelers, Ilgiz Fazulzyanov. He works with enamels like no one in the world, receiving top honors in international competitions. Recently we bought some of his works for our collection. N.G. : Will there be imported projects? Y.G. : For the fall of 2016 we have made an agreement with the Kyoto Costume Institute [which preserves outstanding examples of western clothing from history – RBTH] to bring costumes from the Art Deco period, which is the best part of their collection. And since the apparel concerns mostly evening and ball dresses, we will accompany them with Cartier and Van Cleef & Arpels jewelry. We are preparing an exhibition on stonecutter Vasily Konovalenko, who in the 1980s was forced to emigrate to the U.S. As a result, he was more famous in the States than in Russia, although he always worked with Russian themes, continuing the tradition that the Fabergé Company had made famous. N.G. : Has the museum's budget been reduced due to the crisis? Y.G. : By 10 percent on the whole, which is significant. Fortunately, our main sponsors have not abandoned us. Nevertheless, we are not suffering as much as other museums, especially the ones in the provinces. Everyone visits the Kremlin, and the two million people that visit us annually have not gone anywhere. N.G. : Now you have little space for temporary exhibitions. In the spring of 2015 a decree was issued, according to which you will receive certain premises on Red Square. Has work already begun there? Y.G. : According to President Putin's decree, we will receive the Middle Trading Rows building on Red Square after the reconstruction. We will house a part of our permanent collection there, as well as exhibition halls, restoration workshops and storage facilities. Our collaborators will have to move there from the Kremlin facilities, which we will then open to the public, because our offices, restoration workshops and collections are located in 15th-19th century monuments. For example, a part of the collection is found in the choirs of the Assumption Cathedral, which contains wonderful frescoes, and in the Filaret Annex of the Assumption Belfry, which also has frescoes. Earlier, reconstruction work was expected to be terminated by the end of 2016, but now it is clear that won't happen. But we are waiting for this building. It is indispensable for our exhibition projects. Y.G. : The collection has certainly taken form. These are the treasures of the Russian court, first the court of the grand princes, then the courts of the tsars, then the emperors, but we try to enlarge these collections. Furthermore, whenever we can, we buy Byzantine works, although this happens very rarely. These are icons, and everyone knows that the Kremlin icons are the best in the world. Sometimes we acquire costumes that are related to the coronations of our monarchs. We also expand the collection of orders and we try to develop our contemporary collections of arms and jewels. N.G. : How do you select the arms? Y.G. : The Izhevsk [Weapons] Plant gave as the latest collection as a gift. It was a complete set of Kalashnikov automatic rifles. Now we would like to ask the Kremlin Commandant if they could give us the parade arms and the uniforms of the presidential regiment. It often seems that things used today don't have much value, but in 50 years they won't be found anywhere. The official founding date of the Moscow Kremlin Museum-Reserve is considered March 10, 1806. The collection consists of more than 160,000 exhibits, with about 9,000 found in permanent exhibitions. Treasures that were preserved throughout the centuries by Russian princes and tsars constitute the foundation of the collection. Ancestral relics were indispensable "participants" of sumptuous court ceremonies: coronations, receptions of foreign ambassadors, and parades honoring the Russian monarchs. After the October Revolution of 1917 the museum was flooded with treasures from the Russian Orthodox Church, brought from closed, and often destroyed, churches, cathedrals and monasteries. The main monuments are the ensemble found on Cathedral Square (the Cathedral of the Archangel, the Cathedral of the Annunciation and the Cathedral of the Assumption, as well as the Ivan the Great Belfry) and the Armory Chamber. Yelena Gagarina (daughter of astronaut Yuri Gagarin) has been director of the museum since 2001. Information on exhibitions and ticket prices can be obtained on the museum's website. This text is published in an abridged version.